Creating a niche of Ampoule Filling and Sealing Machine such as Single Head Ampoule Filling and Sealing Machine, Two Head Ampoule Filling and Sealing Machine, Four Head Ampoule Filling and Sealing Machine, Six Head Ampoule Filling and Sealing Machine and Eight Head Ampoule Filling and Sealing Machine at its best, with utmost quality. revered patrons. The offered machine is made in tune with the industry standards and has earned us loads of appreciation. This machine is robust in terms of construction and offers hassle-free operation. It is user friendly as well. We are among the distinguished names in the industry for manufacturing and exporting Single Head ampoule Filling and Sealing Machine. 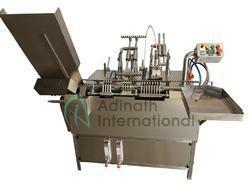 The offered machine is used in pharmaceutical industry for filling ampoules with contents and sealing them. This machine ensures operation under strict parameters of hygiene and is meant to serve for a long period of time. Automatic Four Head Ampoule Filling Sealing Machine built on principle of slant travel of ampoules while filling and sealing, to take care of wide variation of ampoule neck dimensions, thicknesses of available standard ampoules. During the stoppage of rack sequentially pregassing, filling, post gassing, preheating and final sealing is achieved. Duly filled sealed ampoules then collected on collection tray automatically without hand touch. Automatic Six Head Ampoule Filling and Sealing Machine built on principle of slant travel of ampoules while filling and sealing, to take care of wide variation of ampoule neck dimensions, thicknesses of available standard ampoules. Automatic Eight Head Ampoule Filling Sealing Machine built on principle of slant travel of ampoules while filling and sealing, to take care of wide variation of ampoule neck dimensions, thicknesses of available standard ampoules. The sterilized ampoule tray directly loaded in to slant hopper of the unit. The Synchronized star wheel delivers ampoules one by one on moving eccentric ampoule rack in eight’s. During the stoppage of rack sequentially pregassing, filling, post gassing, preheating and final sealing is achieved. Duly filled sealed ampoules then collected on collection tray automatically without hand touch. 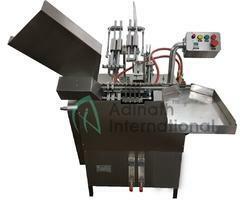 Ampoule Filling and Sealing Machines is suitable for the filling & sealing of glass ampoules. 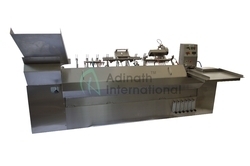 Machine equipped with automatic ampoule feeding, filling and sealing station to complete the automatic filling & sealing of injectable glass ampoules. This Lab Scale Single Head Ampoule Filling & Sealing Machine is widely uses in small scale injectable organizations, R&D laboratory, Universities and other parenteral productions. Apart from the pharmaceutical this machine also uses in the cosmetic industry. Empty washed & sterilized ampoules fed into in-feed hopper from the left hand side of the machine to receiving rack. The moving rack which moves horizontally collect one ampoule from the receiving rack and transfer the ampoule to the machine in left to right in an inclined position through Pre-gassing, Filling, Post Gassing, Pre-heating & sealing stations completes filling & sealing operations. Filled & sealed ampoules are collected automatically in SS tray in upright position without hand touch. Eight Stroke Ampopule Filler built on principle of slant travel of ampoules while filling and sealing, to take care of wide variation of ampoule neck dimensions, thicknesses of available standard ampoules. Automatic Four Stroke Ampoule Filling and Sealing Machine is widely uses ampoule filling machine built on principle of slant travel of ampoules while filling and sealing, to take care of wide variation of ampoule neck dimensions, thicknesses of available standard ampoules. Machine equipped with pre warming station. 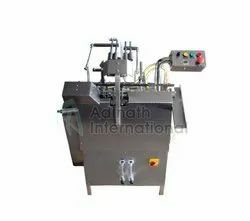 Pharmaceutical Ampoule Filling Machine built on principle of slant travel of ampoules while filling and sealing, to take care of vide variation of ampoule neck dimensions, thicknesses of available standard ampoules. Glass Ampoule Filler built on principle of slant travel of ampoules while filling and sealing, to take care of wide variation of ampoule neck dimensions, thicknesses of available standard ampoules. 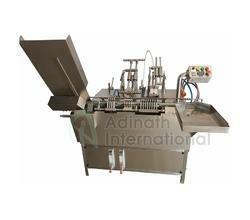 Being a reckoned name in the industry, we have introduced Single Head Ampoule Filling & Sealing Machine. The offered range of machines is of great usage in the pharmaceutical industry. We have designed these machines integrated with filling unit and electrical control panel. Customers can source these machines with the assurance of flawless performance. The offered range of machines owes to compact GMT model and is available at market leading prices. Automatic Ampoule Filler built on principle of slant travel of ampoules while filling and sealing, to take care of wide variation of ampoule neck dimensions, thicknesses of available standard ampoules. Weight 100 Kgs - 800 kgs. 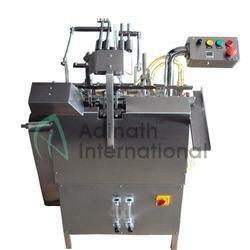 We are engaged in profound business of manufacturing and supplying of Ampoule Filling and Sealing Machine. These machines are fabricated as per the approved industry norms, integrated with advanced working mechanism. Used to cater to the specified filling applications of the pharmaceutical industry, these machines have gained wider market acceptance. We use stainless steel square pipe frame for fabrication of filling unit and thus, assure our customers to have sturdy design. Our organization is among the successful names in the industry for manufacturing and exporting Onion Skin Ampoule Filler. The offered machine is made in tune with the industry standards and has earned us loads of appreciation. This machine is extensively used in the pharmaceutical industry for filling and sealing medicines in ampoules. We are amongs leading manufacturer, supplier and exporter of R & Ampoule Filling and Sealing Machine. 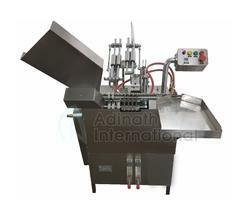 Our range of machines widely uses in small & medium scale pharmaceutical injection preparations. Equipped with single head for filling, our offered machines are available to customers at nominal price tags. Over All Dimensions: 915mm (L) X 610mm (W) X 970mm (H) approx. Net Weight: 90 Kgs approx. Gross Weight: 180 Kgs approx.